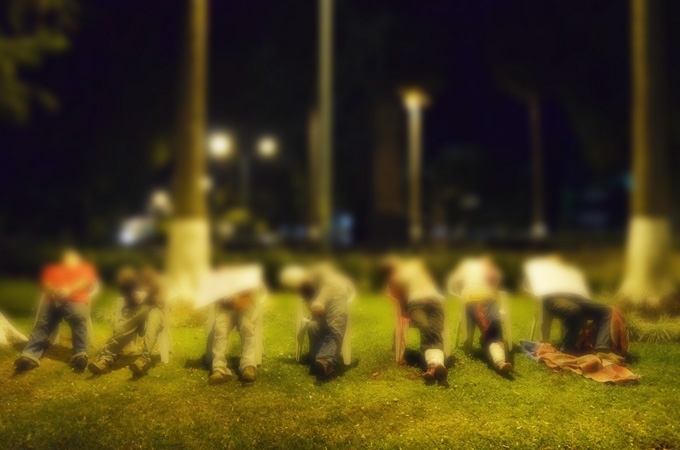 A now common scene of brutality in the country of Mexico due to the United States’ drug and gun problem. The Mexican government estimates that at least another 26,000 have “disappeared” in that same period. That quote comes from this article describing the recent execution and displaying of seven men on a roadside in the Mexican state of Michoacan. Two things should be noted here. First, many of the 70k+ killed have not just been killed but tortured and mutilated as well. Second, it is very likely the actual number killed is even higher than the statistics given and the bulk of those killed has come in just the past three years (60k+ roughly). And now the chaos gets worse. Vigilante groups are forming and attempting to do the primary job that all governments should do: protect its people. A group just outside of Acapulco arrested 12 police officers and a former government official believed to be corrupted by the drug cartels. But evidently even these groups are just as susceptible to bribes and violence as “concerns have surfaced that the vigilantes may be violating the law, the human rights of people they detain, or even cooperating with criminals in some cases.” And as the article on them states, innocent people are getting hurt by these groups because of their lack of training and coordination. Some gun advocates in the U.S. might say the groups are a good thing and it is great the citizens are armed enough to protect themselves. But that ignores the fact the high powered weapons the drug cartels were buying so easily from the U.S. are the cause of these groups forming. And when you see non-uniformed groups of people carrying high powered weapons at a roadblock knowing drug cartels are everywhere, are you going to stop your car and agree to chat with these strangers? Probably not and it is no surprise the people who were reported hurt by the vigilante groups were (likely very frightened) tourists. The chaos is creating more destruction than answers. There is little doubt the scale of this violence has grown to these horrific proportions because of two major problems in another country. America’s drug problem and lax gun laws have made the country of Mexico a war zone where groups of people are viciously massacred on a daily basis. Stemming the illegal flow of guns from the U.S. to Mexico rarely, if ever, receives attention as Congress debates changes in weapon laws. This violence heavily takes place around the border and has played a role (along with the U.S.’s sluggish economy) in bringing the net immigration from Mexico to zero or possibly negative. And the even sadder part of this story is the fact the U.S. government and media’s answer to this has been mostly ignoring the issue entirely. The most stark display of how silent the government and media are on this issue was the fact the Mexican Drug War did not even get a mention in the third presidential debate, a debate solely concerning foreign policy. I still wonder what the body count must reach to get the same amount of attention as other foreign policy issues. 100,000? Half a million? Who knows? Posted on March 28, 2013 by Paul PhillipsPosted in Media, Politics, UncategorizedTagged media ignoring mexican drug war, mexican drug cartels, mexican drug violence, mexican drug war, mexican vigilante group arrests police, mexico, u.s. government ignoring mexico. Previous Previous post: Schizophrenic U.S. Policy in Middle East: What Type of Government do we Support?